In a large bowl, whisk together pineapple juice, ketchup, soy sauce, brown sugar, garlic, and ginger until combined. Add chicken to a large resealable plastic bag and pour in marinade. Let marinate in the fridge at least 2 hours and up to overnight. When ready to grill, heat grill to high. Oil grates and grill chicken, basting with marinade, until charred and cooked through, 8 minutes per side. 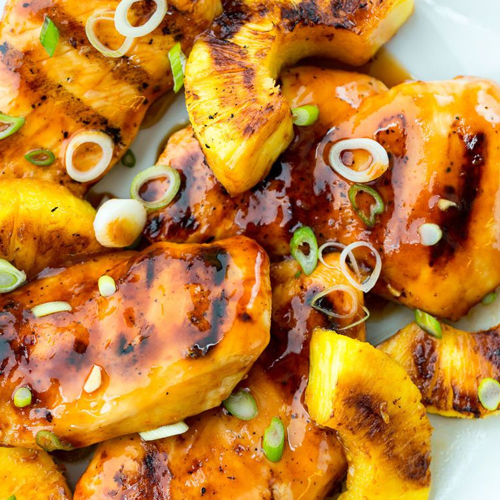 Toss pineapple with oil and grill until charred, 2 minutes per side. Garnish chicken and pineapple with green onions before serving. 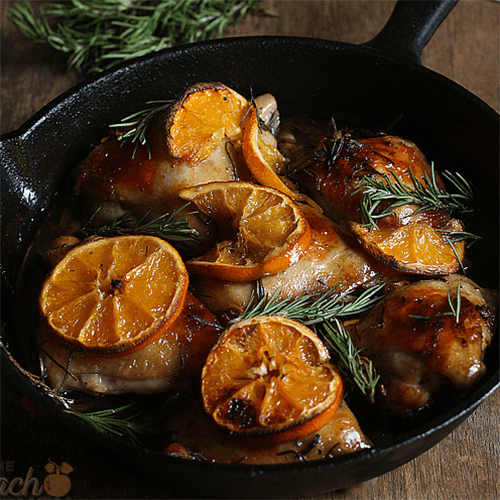 Combine olive oil, rosemary, minced garlic, soy sauce, 2 tbsp sugar, salt and pepper and the juice of one orange. Mix well. Marinate chicken pieces in the mixture for half a day or overnight. 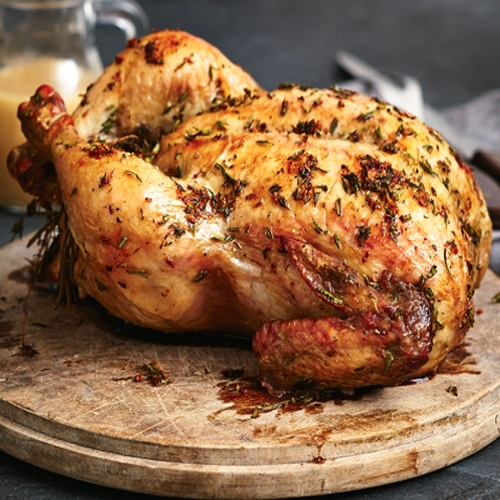 Roast chicken in an oven at 220ºC for 20 minutes. Then reduce temperature to 190ºC and continue roasting for 15 - 20 more minutes or until chicken is brown. Baste chicken with leftover marinade from time to time. Add orange slices and continue baking for 5 minutes until the fruit caramelizes. In a large Ziploc bag add soy sauce, balsamic vinegar, olive oil, brown sugar, Worcestershire, dijon mustard, dried thyme, chopped garlic, lime juice, and salt/pepper to taste. 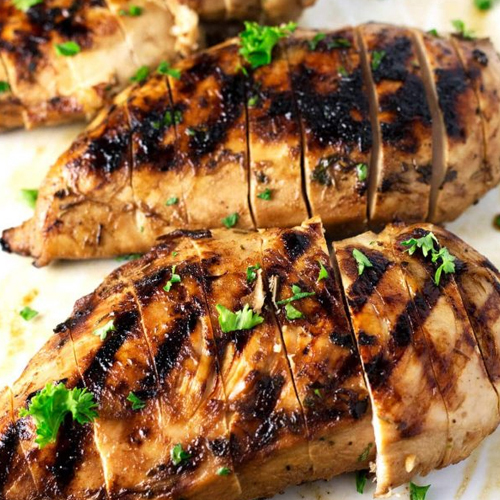 Grill chicken, flipping once, for 5-8 minutes on each side*, or until chicken is cooked through, being careful not to overcook. Remove from grill and let rest 5 minutes then serve immediately. For the beans Preheat oven to 180 C.
Add green beans, chopped garlic, olive oil, and salt & pepper to baking sheet. Toss evenly to coat. Place the whole unpeeled garlic cloves and lemon slices throughout the pan. Roast for 15 minutes. Flip. Roast 15-20 min more, until green beans are roasted brown. Let stand for 2-3 minutes. Stir to evenly distribute lemon juice. Serve. In a blender, combine the soy sauce, honey, oil, lime zest, lime juice, garlic, ginger, Sriracha and salt. Blend until completely smooth. Pour 1/2 cup of the marinade into a small bowl; cover and refrigerate until ready to serve (this will be your sauce). Combine the chicken and remaining marinade in a large Ziplock bag and seal tightly. Place in a bowl (in case of leakage) and marinate in the fridge for at least 6 hours or overnight. 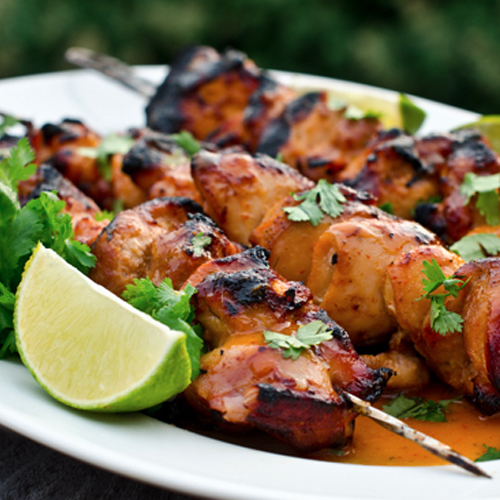 Remove the chicken from the marinade and thread onto skewers, folding the pieces in half if they are long and thin. Transfer the skewers to a platter. Warm up the reserved marinade in the microwave and either drizzle it over top or place it alongside. 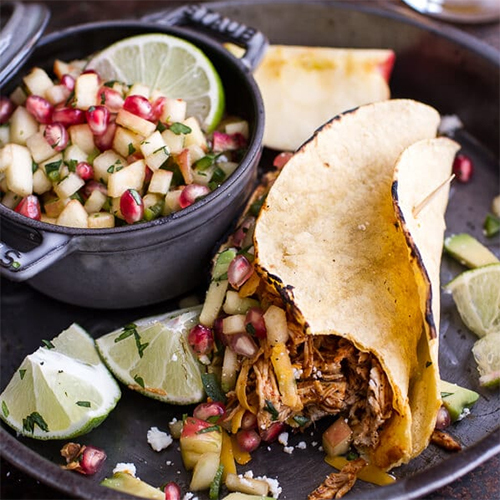 Scatter the chopped coriander over top and garnish the platter with lime wedges and coriander sprigs. Preheat oven to 180°C. Combine the ginger, cumin, ground coriander, olive oil and 1 tsp each salt and pepper. Rub over the chicken, onion, sweet potato and garlic, then place all in a lined roasting tray. Place in the oven and cook for 40 minutes or until golden and cooked through. For the couscous, combine all the ingredients in a bowl and keep warm. Combine the yoghurt and harissa. Set aside. 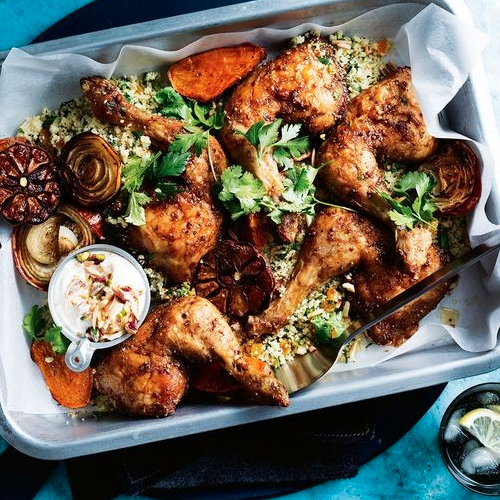 Remove chicken from the oven and serve with couscous, yoghurt and top with fresh coriander. Preheat an oven to 180C and line a large baking tray with parchment paper. Lay the chicken wings on the tray, and generously season with salt and pepper allow to sit for 10 minutes. Place in the oven on a middle rack and cook for about a two hours turning the wings as they get a dark golden and almost crispy texture. Continue cooking until the flipped side gets nice and crispy. During this cooking time, make the sauce. Add everything but the shallots, coriander, and peanuts to a pan. Cook on medium, to medium high heat, stirring along the way, until it begins to boil, then reduce the heat to a simmer, and continue cooking until you have reduced the sauce in half. Remove the wings from the oven. Pour the sauce into a large mixing bowl, then add in the wings and toss to coat. Pour the wings and sauce back on to the tray and return to the oven for 10 minutes. Take that same mixing bowl and toss in the shallots, coriander, and chopped peanuts. 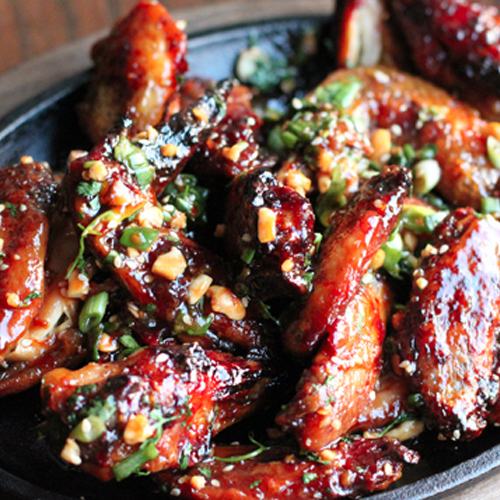 Once the wings are cooked, remove and add them back into the bowl, tossing with the green onions, cilantro, and peanuts. 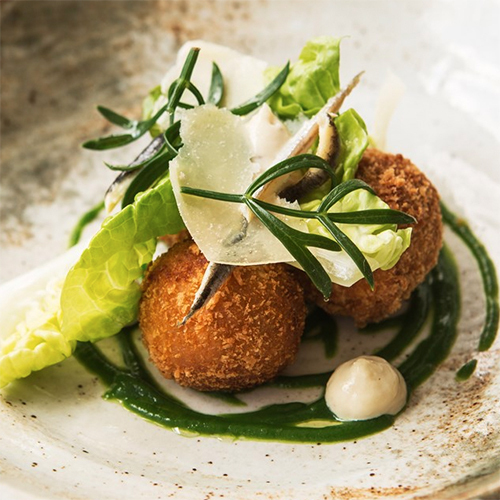 Gently slide everything onto your serving dish, and dig in! Garlic Butter - In small bowl, stir together butter, garlic, thyme, rosemary, salt and pepper. Roast Chicken - Sprinkle cavity of chicken with salt and pepper; fill with onion, thyme and rosemary. Rub chicken all over with Garlic Butter. Place, breast side up, on greased rack in roasting pan. Roast in 190°C oven for 45 minutes, baste and continue to roast, basting occasionally, until instant-read thermometer inserted in thickest part of thigh reads 85°C, about 30 more minutes. Discard contents of cavity. Using tongs, tip chicken to pour juices into pan. Remove chicken to platter; cover loosely with foil. Let rest for 20 minutes before carving. Gravy - Meanwhile, tilt pan so juices collect at 1 end. Skim fat from surface, reserving 1 tbsp. In small bowl, stir together butter, flour and reserved fat; set aside. Place pan over medium heat; whisk in wine. Cook, whisking and scraping up browned bits, until reduced by half, about 1 minute. Whisk in stock, bring to boil. Gradually whisk in butter mixture, 2 tsp at a time, until smooth. Cook, whisking constantly, until thickened, about 2 minutes. Strain through fine-mesh sieve; stir in pepper. If necessary, stir in enough boiling water to loosen and yield 1 cup gravy. Serve with chicken. In a medium pot over medium hear, saute corn in 1 tablespoon butter and 1 tablespoon oil for 5 minutes. Remove. Add remaining butter and oil to the pan and add garlic and onion and saute for 5 minutes. To the pan, add 3/4 of the sautéed corn back into the pot with the garlic and onion. Stir in jalapenos, chicken stock, chili powder and reserved corn cobs and simmer for 20 minutes. Remove from heat and discard cobs. Add sliced chicken thighs and poach on medium heat (do not boil) until cooked through - around 5 - 7 minutes. Stir in Parmesan cheese, cream, lime zest, lime juice and remaining sautéed corn. Place into bowls and top with desired toppings. 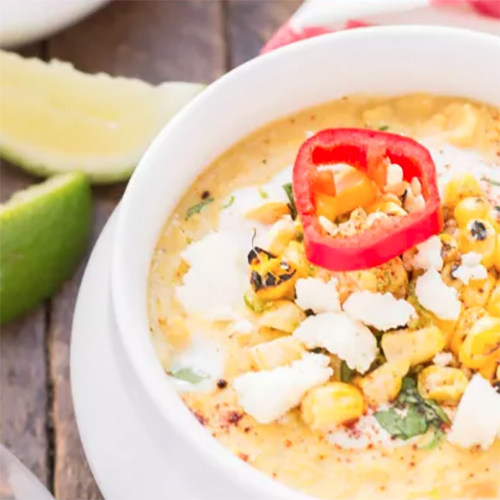 Toppings: coriander, crumbled hard feta cheese, chili powder, charred corn kernels, limes wedges and/or sour cream thinned with lime juice. Toated tortillas. *To char corn place 1 whole corn cob over a gas burner, set to medium heat, and with a close eye, watch until the cobs are blistered - Or rotate under a grill.